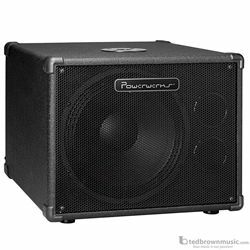 For serious low-end in a compact format, look no further than the Powerwerks® PW112-S features a 200-watt RMS power rating (400 watts Peak). Includes a heavy-duty Powerwerks® 12-inch speaker with crossover; Tolex-covered cabinet with metal grill; and corner protectors to protect it from damage on the road. Includes a metal speaker stand mount on top of the cabinet.